“Those who don’t learn from history are doomed to repeat it,” our teachers always told us. There is truth in that maxim, and most especially for writers. By looking back at where we’ve been, we have a better idea of where we’re going. For instance, recently I was digging through some old press clippings from my hometown paper. 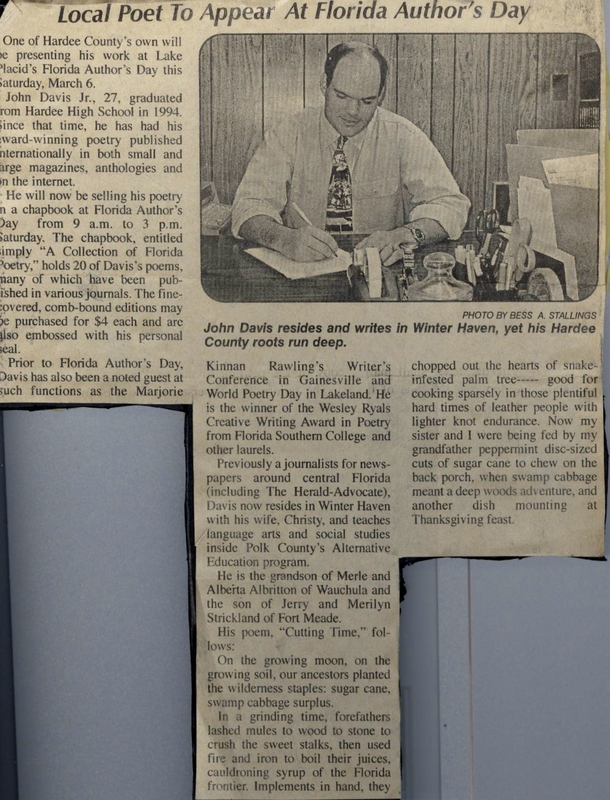 These clippings heralded my appearance at venues like Florida Authors Day (many, many years ago) and chronicled awards I had won. At the time these pieces were written, I was a young man in my twenties, just poking my nose into the literary world. But by looking back on them and gaining a sense of my own writing history, I was able to more clearly visualize the road before me as a more mature writer today: Completing my MFA, finishing my next book (this time, it WILL NOT be self-published), and gaining more impressive publication credits from esteemed literary journals are all goals I now possess. I have been better equipped to achieve these objectives by making some wrong turns along the writing path, and I’ve also gained some knowledge and and experience that have prepared me to hone my craft and perfect my unique writing voice. An occasional walk down memory lane can be just the thing to motivate you as a writer, and perhaps it is indeed necessary to align one’s vision to the road ahead. I have no regrets about the moves I made as a younger man — they’ve been the impetuses that have pushed me toward greater things in the present, and hopefully, the future.